BioMag® ProMax Albumin Removal Kit | Polysciences, Inc. 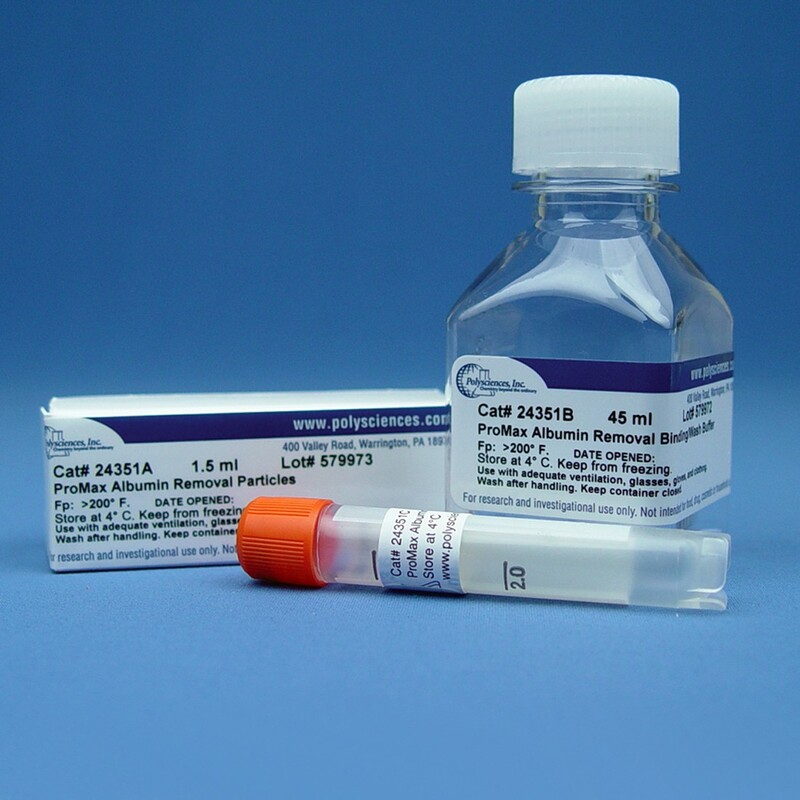 The BioMag® ProMax Albumin Removal Kit enables the quick removal of human serum albumin from samples. Based on BioMag® superparamagnetic particle technology, BioMag® ProMax Albumin Removal particles supplied in the kit, along with optimized buffers, allow for the selective binding and release of the less abundant proteins in the serum. The protocol can be completed in 30 minutes or less, so researchers can move on to analyzing important biomarkers in the serum. The BioMag® ProMax protocol is scalable and can be used in conjunction with the ProMax Serum IgG Removal Kit (Cat. #24352-1). Chade AR, Zhu XY, Krier JD, Jordan KL, Textor SC, Grande JP, ... & Lerman LO. (2010) Endothelial progenitor cells homing and renal repair in experimental renovascular disease. Stem cells, 28(6), 1039-1047. MORI, M., ICHIBANGASE, T., YAMASHITA, S., KIJIMA-SUDA, I., KAWAHARA, M., & IMAI, K. (2015). Quantification of horse plasma proteins altered by xylazine using the fluorogenic derivatization-liquid chromatography-tandem mass spectrometry. Journal of equine science, 26(4), 141-146. Perez P, Adriaansen J, Goldsmith CM, Zheng C, & Baum BJ. (2011) Transgenic α‐1‐antitrypsin secreted into the bloodstream from salivary glands is biologically active. Oral diseases, 17(5), 476-483.